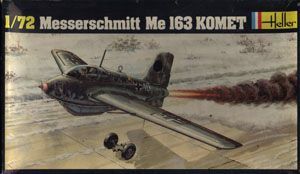 The Heller kit was the best 1/72 Me 163B available until the Academy kit was released in 2000. 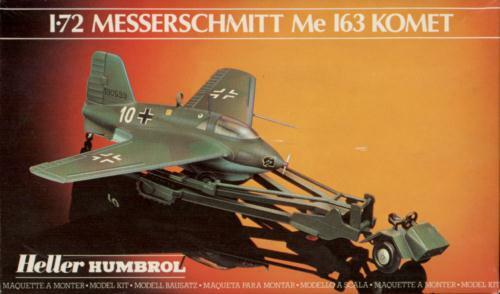 It is an older kit, with raised panel lines and limited cockpit detail. I haven't measured it in detail, but it appears to be accurate in shape and detail. It has one shape problem: the spine is too narrow, which makes the canopy cross-section almost circular, and leaves too little room between the rear view windows. The thickness of the fairings of the wing root and skid fairing is exaggerated, and the track of the starting dolly is slightly too large. The Scheuch-Schlepper transportation vehicle on the other hand reportedly is very inaccurate. Based on the photos of a surviving Scheuch-Schlepper that surfaced in 2003, this judgment is correct. The engine cover shape is way off, the balloon tyres are unrealistic, and the rear end is incorrect. Skitz Fijan's site hosted by Pedro Freitas (White 10, White 13 is an Airfix model). 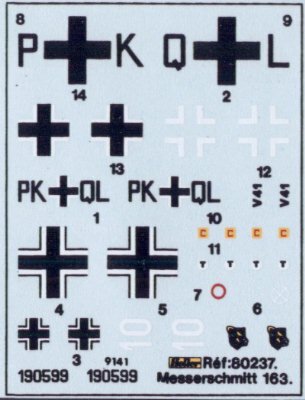 The decal sheet of the 1984-1989 issue (most likely also used for other issues). It shows decals for the all-red V41/PK+QL and 190599/White 10 (possible this aircraft, 190598). 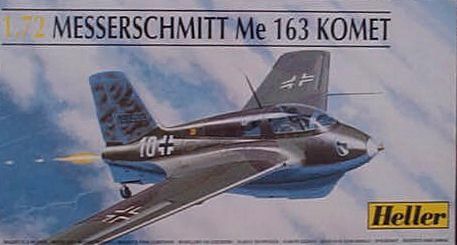 Fuel stenciling is provided, as are two 2./JG400 badges (bad quality). Swastikas are missing.